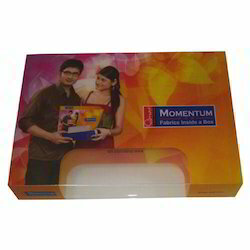 Presenting an excellent choice for our esteemed patrons, we offer a wide gamut of PP (Polypropylene Plastic) Printed Boxes mainly used for gift items and goods. These boxes have an ability to store the items efficiently for a longer period of time. These boxes are widely appreciated and accepted for their unique attributes by our clients spread all the globe. These are accessible by us at affordable rates. Our utmost goal is to put an end to the requirements by providing ample provisions given to our precious patrons. We are offering a wide extent of PP (Polypropylene Plastic) Printed Boxes that are used for packaging and transporting goods. These boxes can be prevailed in different specifications.These products are marked by flawless craftsmanship by our qualified team members to meet the international quality standards.